Legend Fighting Championship 11 (April 27 2013) at Chin Woo Stadium, Kuala Lumpur Malaysia. 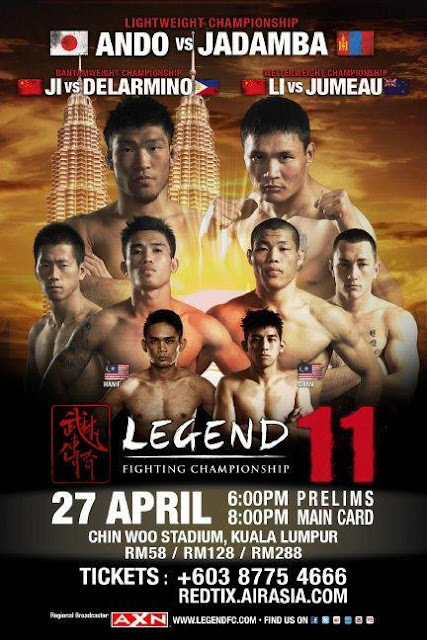 MMA fanatics might want to look out for yet another exciting night as Legend Fighting Championsip 11 is set to erupt in Chin Woo Stadium this end of April. Malaysia will play host to the eleventh installment of the hugely successful Legend Fighting Championship at Chinwoo Stadium in the heart of Kuala Lumpur. The tournament will bring in national champion Mixed Martial Artists from throughout the region in the Asia-Pacific Championship of MMA. Featuring twelve action-packed fights including three Asia-Pacific title bouts, Legend 11 promises to be an unforgettable night of world-class martial arts. With Legend Fighting Championship broadcast by AXN in Malaysia and the rest of Southeast Asia, and syndicated across a total of 152 countries via 22 broadcast partners, a global MMA audience of over 279 million homes will have their eyes on Malaysia at the end of April. In the main event, Legend Lightweight Champion, Jadamba Narantungalag from Mongolia, will look to defend his title against Japan’s Koji “The Commander” Ando and his devastating grappling and ground-and-pound game. Legend 11 will also feature two co-main events: the Legend Bantamweight Title will be on the line for China’s “The Execution” Ji Xian, and Filipino knock-out artist Agustin “Tamasak” Delarmino, Jr., while in the second co-main event, China’s top welterweight Li “The Leech” Jingliang, looks to claim the Welterweight Title against Luke Jumeau, the well-rounded fighter from New Zealand who is equally dangerous on his feet and on the ground. If you are one to be thrilled by the heart pounding actions of a good MMA fight, you should really check out this soon to be legendary night. The MMA fighters are more than ready to fight, win, and amaze you with the determination and perseverance. Legend 11 tickets are available from April 2, 2013 through Airasia Redtix at http://www.airasiaredtix.com/Events/LegendFightingChampionship/. 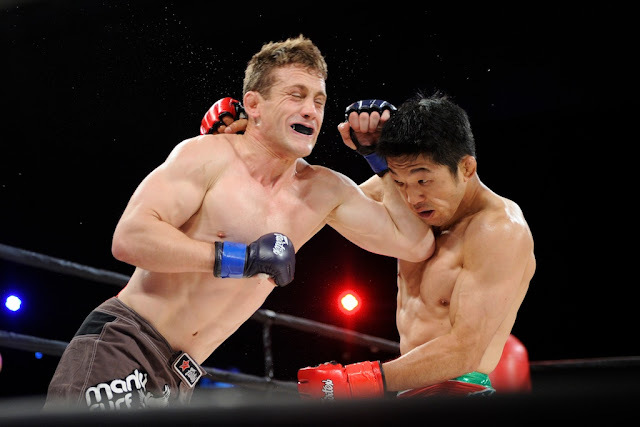 For more information, please visit the Legend Fighting Championship website at www.legendfc.com.